This college is a very good college. As a good marks in that all things are too good. 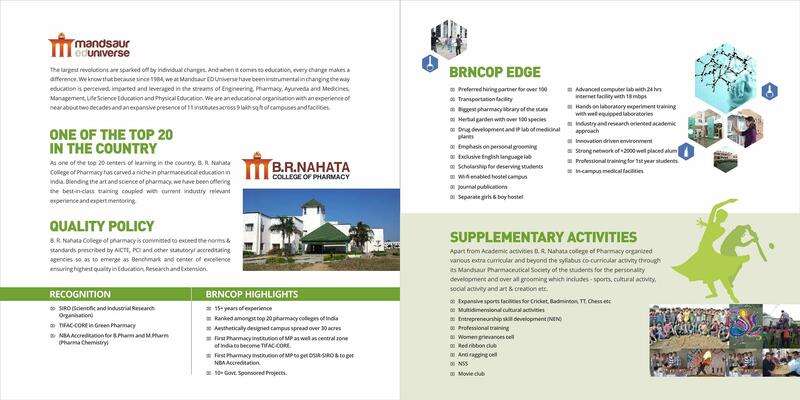 B. R. Nahata College of Pharmacy (BRNCP) is acknowledged for its eminence for one decade and has unrivaled infrastructure, faculty and placement profile. The institution works with its goal to emerge as standard and center of excellence ensuring highest superiority in Education, Research and Extension with its vision to enhance interdisciplinary research in pharmaceutical sciences. The mission of the institution is to boost the International standards of pharmacy profession with the aid of modern pharmacy and Indian systems of medicine. Rating: It is rated as No. 1 in M. P. by Eurasia Times. Accreditation: The courses are accredited by NBA, AICTE. TIFAC-CORE: It is a Centre for Relevance and Excellence (CORE) from Technology Information, Forecasting and Assessment Council (TIFAC), New Delhi. SIRO: Department of Scientific and Industrial Research (DSIR)-Govt. of India conferred the status of Scientific and Industrial Research Organization (SIRO) to the institute. Specialized Career Preparation: Students are facilitated with guidance to choose universities, Entrepreneurship and higher studies such as GATE, CAT, GRE, etc.